Being a dairy farm, the natural standouts amongst an already stellar cast of animals and people were the Holstein Friesian cows. These vast black and white creatures, despite being more than twice my size and incredibly intimidating, were surprisingly gentle and timid. I spent ample time with the dairy herd and certainly not under protest. I cherished every moment spent working with these animals; from simply walking the cows from their paddock to the milking itself, I was captivated by their every aspect. It was a unique and humbling experience to be able to stand side-by-side with these huge animals, an experience I would never grow sick of, and although I craved the feeling of being around them, I sensed the feeling was not always mutual. No matter how I approached these black and white beasts, there was always this glazed panic in their dark marble-like eyes. A sort of fear and defeat that I suppose I didn’t like to acknowledge. Feeding time was another task I thoroughly enjoyed. After the completion of routine cleaning duties and the laborious milking rounds, calf-feeding was the final task of the day. What I considered to be the calm after a very enjoyable storm. My colleague and I would set off in a ute alongside our dog companions, listening to the only functioning radio station in Lake Alexandrina, the back filled with large plastic buckets of milk to feed between 10-50 impatient stomachs, depending on the time of year. I vividly remember how each time we arrived at a group, calves would flock to the fence line in masses, whilst bellowing for a feed. They all had these large black marble-like eyes, complimented by unbelievably long eyelashes that I was admittedly quite envious of, but it was their gentle and kind nature that I truly admired. It was not unusual for me to spend hours after feeding, playing with the calves and laying with those who had fallen victim to illness. I loved their company, and it seemed they too enjoyed my presence. How their mature-aged counterparts, who were once just as lively and outgoing as their offspring, became so withdrawn and fearful of the world around them was a question I found myself dwelling upon. It was as if something had changed them. Or rather someone. 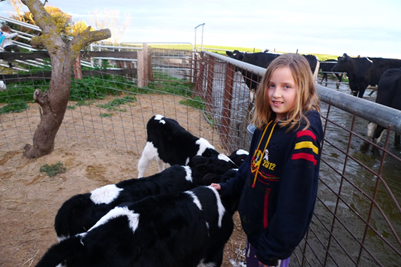 I was 12 when I decided that I was destined to be a dairy farmer and live out my days roaming paddocks in a pair of mucky, oversized work boots with a glass of unpasteurised milk in hand and a dog by my side. Over the years, I had become very capable and equipped to perform all the duties necessary to be a dairy farmer, and to be honest, truly loved the profession and all its perks. 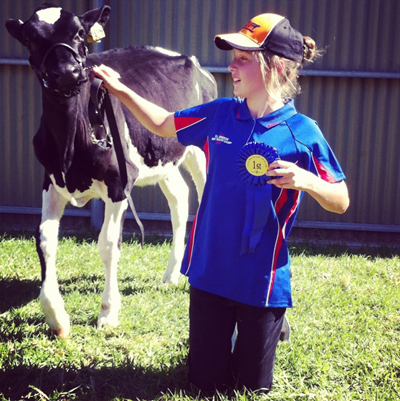 I went on to pursue dairy youth camps and a competition in which I placed first in my category (as pictured below). Little did I know things were soon about to change. In 2016, my devotion to the dairy industry was finally called into question, prompted by an innocent visit to a friend’s house who just happened to be vegan (what a freak!). After discovering a pamphlet regarding the dairy industry, I found myself shocked, reading of the immense violence and cruelty that supposedly took place within the industry I hoped to pursue a career in. I had known, whether it be subconsciously or consciously, that these practises occurred, but until that moment, had never openly questioned their morality. It felt like an attack had been launched on me and one of the biggest aspects of my life. I told her that the sheet was well composed crap, clearly produced by a group who knew little about the dairy industry. The conversation subsided, but my stream of thought certainly did not. My mind was approaching a cross road. It seemed a large part of me wanted nothing more than to supress the idea that the dairy industry was capable of such immense cruelty, while a small yet surprisingly persistent part of me needed to pursue the truth. I knew that one would make my life and livelihood far easier. So shameful to say, I sent my conscience to a hypothetical corner and continued down the former path of ignorance and bliss. Or so I thought. On visiting the dairy farm following this incident, things felt different. It was like a veil had been lifted from my eyes, and I was just now beginning to see my world for what it really was, an unnecessary tangle of pain and suffering for the animals I had wanted nothing more but to act in favour of. I could no longer feed the newborn calves without recognising that at least half of them would shortly find themselves in the back of a truck, destined for the slaughterhouse. I could no longer sit and nurse the injured or ill calves who were bound to die from their symptoms, knowing full well that they didn't have to. Even the artificial insemination which had once fascinated me was now only a reminder of the fact that in nine months’ time, a mother would have to endure the pain of having her calf torn from her yet again. A cruel repetitive cycle that only an electric prod and blade would free her from. Worse than her undignified death was the fact that the daughters she had not been fortunate enough to know would take her place. The daughters I knew she had bellowed for, scaled fences, and chased cars for. All this pain, for what? The milk on someone’s cereal? The cheesy garnish to a pot of pasta? Cholesterol? The practises performed on these farms had always seemed essential to me. A necessary part of life and human survival. A series of false beliefs instilled in me from a young impressionable age that had finally lost their façade. A veil had been lifted from my eyes, and I wasn’t about to wish it back. It was on this day or soon after that I decided to phase out dairy farming from my life. Now, during 2019, I am proud to say that I have been clean of dairy farming for at least 2 years, and during that time also decided to pursue a vegan lifestyle for ethical and environmental reasons, health simply being a bonus. Although I no longer participate in dairy farming, I still consider the people who I worked closely with during that time in my life as family and will continue to hold close ties with them as long as they will have me. Over the past year of living a vegan lifestyle, I have fallen into a number of different activism groups including Anonymous for the Voiceless Adelaide (and Darwin once), Adelaide Vegan Outreach, a few of my own personal projects, and now I am a proud member of The Raven Corps. I have high hopes for the future and all it holds for all beings, human and non-human. No sentient being should be condemned to a life of pain and suffering, on the basis of the body they are born into, and as an individual fortunate enough to luck out in life’s great lottery, I feel it is my obligation to change the imbalance of power that exists in this world.